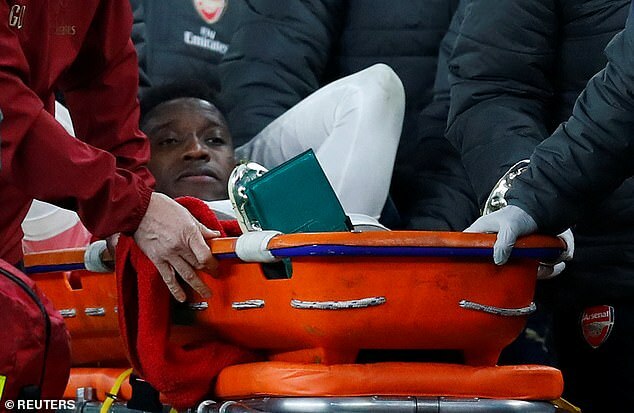 Danny Welbeck suffered a suspected broken ankle in Arsenal’s Europa League draw against Sporting Lisbon, leaving his team-mates looking shocked as they came to terms with the injury. Welbeck was quickly attended to by Arsenal medics and treated on the pitch, with an oxygen mask administered and a leg brace in place, before being sent to hospital to get the injury examined. Unai Emery later confirmed he had broken his ankle. The striker had landed awkwardly while trying to attack a header in the first half. Team-mates looked on in shock at the extent of the injury, with Matteo Guendouzi visibly distressed by holding both hands to his face as Welbeck was treated. Manager Unai Emery expressed how upset he was by the injury to the England striker. ‘This is the worst news tonight,’ Emery said. ‘We think it’s serious. He was working well, doing a good match. He had chances. Speaking after the 0-0 draw, goalkeeper Petr Cech was quick to insist that all the squad were thinking about was Welbeck. ‘Danny [Welbeck]’s looked like a serious injury which is not nice to see and our thoughts are with him and also Stephan [Lichtsteiner],’ Cech told BT Sport. Alex Iwobi added: ‘It is very mentally challenging but sometimes it comes with the game. Ex-Arsenal defender Martin Keown commented: ‘I think he has tried to plant his foot and it’s got stuck behind him, all the way through and you can see it is written on Guendouzi’s face the extent of the injury. As the seriousness of the injury quickly became apparent, the Emirates Stadium fell eerily quiet as medical teams took due care in attending to Welbeck. The striker was down for five minutes in the Sporting Lisbon box before he was carefully placed onto a stretcher and carried off to chants of his name from the club’s supporters, who also applauded him off. Former Manchester United team-mate Nani went out of his way to console Welbeck as he lay on the turf and while he was removed from the field of play. Nani offered support to his former team-mate afterwards: ‘It was a very sad moment. ‘I feel very sorry for him, he is a great person. A good lad and a good friend. When that kind of moment happens in the game you feel very sad. Welbeck managed to exchange handshakes of support with team-mates as he departed but there are now fears the nature of the injury could rule him out long term. The incident occurred in the 25th minute as Welbeck ghosted in from the back post to attack a central cross from Stephan Lichtsteiner on the right. Although he made contact with his header, the battle with a Sporting defender saw him land awkwardly on the ankle leaving him rolling around in agony. Almost immediately the Sporting keeper Renan Ribeiro spotted the nature of the injury, pointing towards the striker to bring the game to a halt. Pierre-Emerick Aubameyang replaced Welbeck in the Europa League tie.